This is an idea I was playing around with at Christmas. 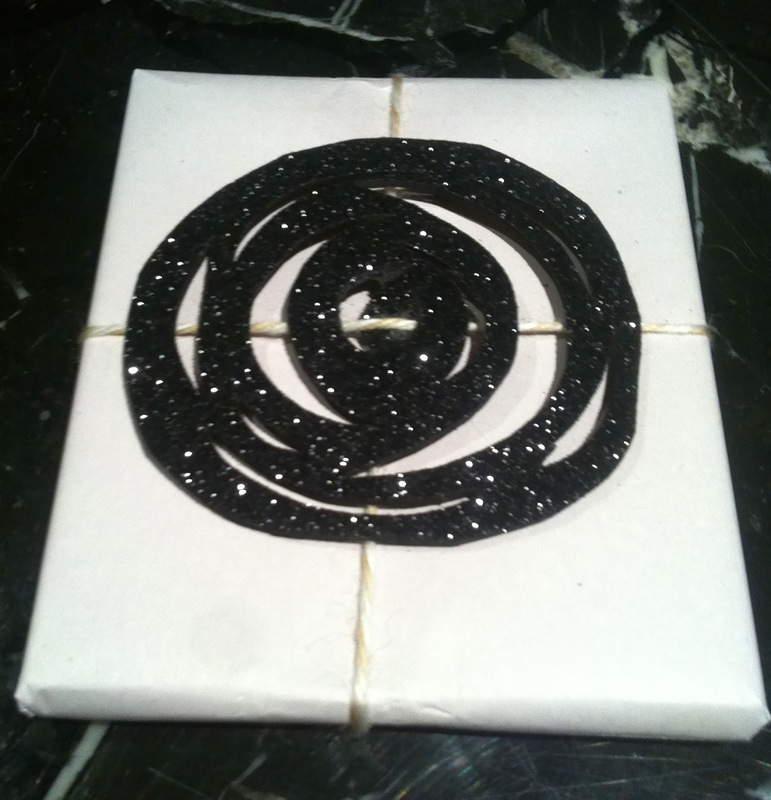 You might remember that post where I had topped gifts with simple shapes cut from glittering Evafoam. Since then, I've toyed with a few other shapes and ideas, and this one is a firm favourite. It's a rose silhouette, and each one I've done has been slightly different. Some people 'see' the rose straight away, and others have to squint, but it's there...ha! If I can remember to photograph them, I'll add more rose silhouettes as time goes by. 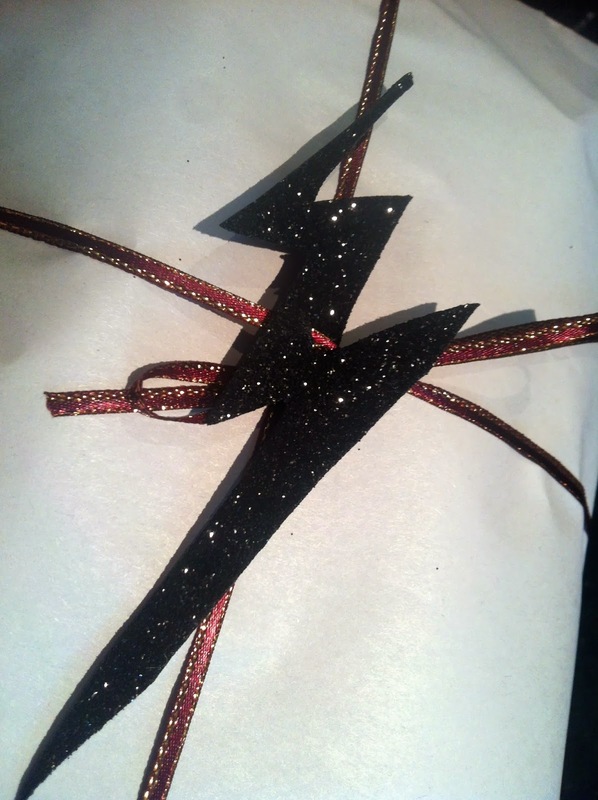 I also did this lightning bolt for my nephew which he thought was pretty darned cool...er...wicked...er...sick....I don't know what the terminology is these days. But he liked it anyway. Basically all you need to create these, is a piece of card or this glittering Evafoam stuff that's now available at the $2 stores, a Stanley knife, and a bit of imagination. If you're stuck, just Google 'silhouette' and the shape you're after, and you'll find lots of food for thought. Remember too, to put two little buttonhole type slits in the centre of your silhouette, through which to thread your tie. Thin ribbon, yarn, kitchen string or butchers/carpenters twine seems to work best as the garland, as does the plain background of butchers paper, brown paper or any other plain coloured wrap. I love this effect and it has real WOW factor when placed amongst a bunch of other gaudily wrapped gifts. I would have done a heart shaped one for Valentines Day to share with you, but I left the sheet of red Evafoam on the countertop at the aforementioned $2 store, and a black heart just didn't seem right to me. I'm now experimenting with a Chanel inspired interlocking black 'C's topper, a reindeer, a teddy bear and a few other little ideas. One sheet of Evafoam costs just $2, and will yield dozens of Present Toppers so it's a fun craft, and really gives your gifts that sense of anticipation that comes with a classily wrapped package. And it goes without saying, but I'll say it anyway as all good Mums would, PLEASE exercise caution when working with Stanley knifes or craft knives. Those little beggars are sharp! Lol re the black heart for Valentine's Day.....I love this 'pretty'. Honestly you are like my sister's twin, she always trots out the most beautifully wrapped gifts for every event. I am not kidding my wrapping looks like rubbish in comparison. Another lovely idea Mimi. I will have to look out for the glitter evafoam. I don't think our $2 shop stocks it.